Sebastian Lort is a Breton conjurer who may be found in Rimerock Burrow, far west and slightly north of Solitude. 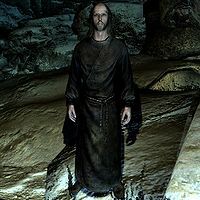 During Clavicus Vile's daedric quest, Barbas tells you that Sebastian was a powerful wizard whose daughter worshipped Hircine. When she became a werewolf, Sebastian asked Clavicus for a cure, who gave him The Rueful Axe to kill her with. The burrow is a small, linear cave. There is an initial entry area, guarded by a leveled atronach, then a work area, and in the very back down a short path is a bedroom area. When you enter, Sebastian may be crouched over an arcane enchanter in the work area. You may find a copy of the Conjuration skill book 2920, Hearth Fire, v9, along with a small library of other books. There is also a chest containing leveled loot. A Daedra's Best Friend: Help Barbas reunite with his master. He has two lines of unused dialogue: "Clavicus sent you didn't he?" and "You can't have the Axe! It's all I have left now!" Instead of being replaced by a generic conjurer after he is killed during A Daedra's Best Friend, he will respawn when the cave resets after 30 days. This page was last modified on 7 August 2017, at 18:52.